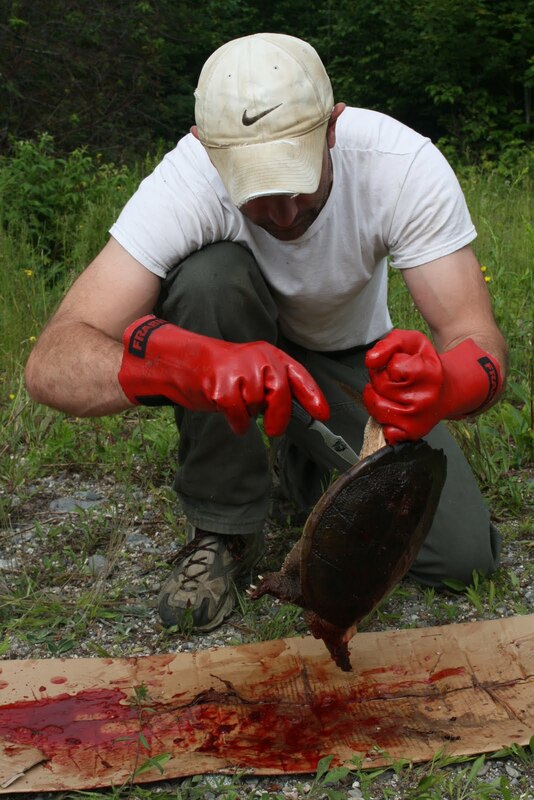 The Maine Outdoorsman: Snapping Turtle Surprise! With a hatchet in my right hand and wielding a large knife in the other, I stared at the two turtles with slight dread knowing the extensive task that lay before me. Though I had seen a quick television clip a few years ago, on butchering turtles, most of that memory had faded. What remained of that recollection, were a scattered series of cuts and hacks, I was only semi-confident would end in a properly butchered animal. Of course the most obvious place to start was the removal of the beasts head and dangerous mouth implements, capable of removing a man’s hand at the wrist even after the critters decapitation. (I was even told later that because of the low oxygen environment that a turtles brain typically exists in that its brain is still functioning hours after it is severed from its body!) With any animal, it is always a sportsman’s desire it be dispatched quickly and humanely. Given snapping turtles impressive defensive capabilities, the most direct approach, is to deliver a hard blow to the back of its neck with a sharp axe, completely removing the head in 2-3 quick blows. In a scene reminiscent of what you would see in the movie “Psycho”, my 2-3 quick blows were forcibly multiplied by adrenaline as the gagging, snapping, thrashing thirty pound turtle threatened to tear off one of my fingers. No matter my degree of prior hoping, turtle one did not go softly into that goodnight. Splattered in drops of turtle blood and breathing heavily, the task was complete. As when killing anything, sometimes even the best laid plans do not yield the most perfect results. What a sportsman can hope for is that these mistakes are taken as learning experiences and next times yield more impressive results. 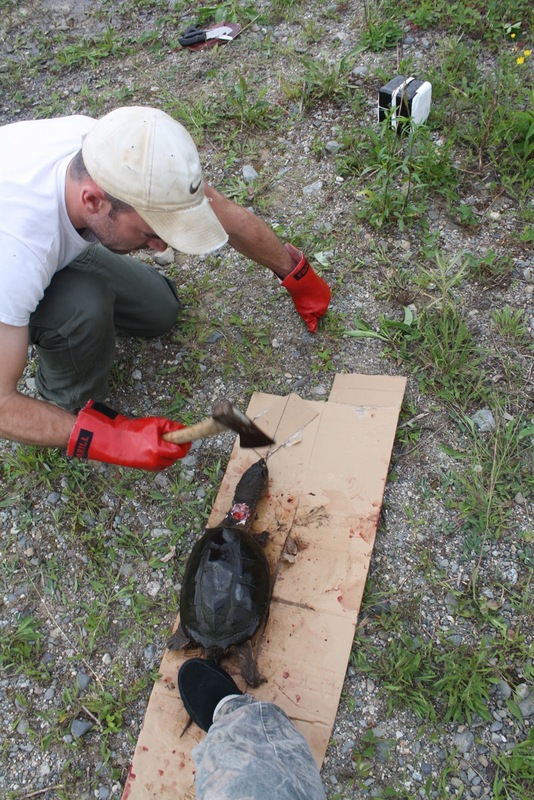 Turtle two had its head severed completely from its body in 2 blows of the axe. One of the best blog posts ever! I worked for a man once that caught snapping turtles. I must say it was fantastic.